The Moler Family of Jefferson County, West Virginia. 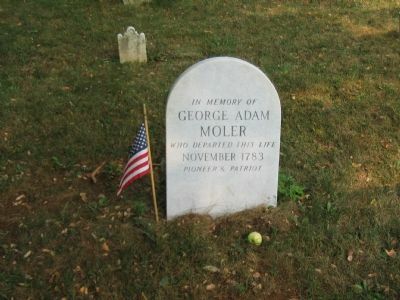 In this cemetery are buried George Adam Moler (1714–1783) and his wife Eve. 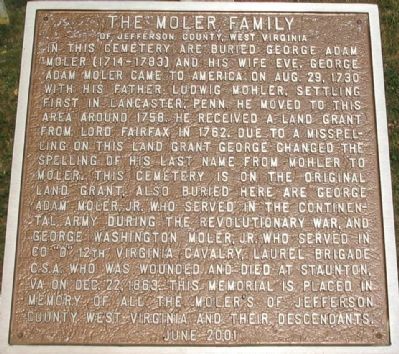 George Adam Moler came to American on Aug. 29, 1730 with his father Ludwig Mohler, settling first in Lancaster, Penn. He moved to this area around 1758. He received a land grant from Lord Fairfax in 1762. Due to a misspelling on this land grant George changed the spelling of his last name from Mohler to Moler. This cemetery is on the original land grant. 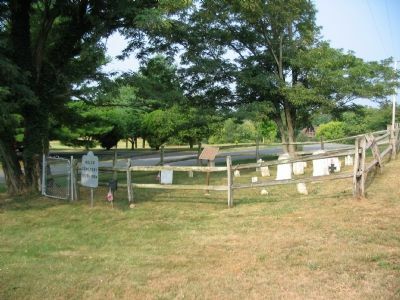 Also buried here are George Adam Moler, Jr, who served in the Continental Army during the Revolutionary War and George Washington Moler, Jr. who served in Co “D” 12th Virginia Cavalry, Laurel Brigade, C.S.A. who was wounded and died at Staunton, VA on Dec. 22, 1863. This memorial is placed in memory of all the Molers of Jefferson County, West Virginia and their descendants. of Bakerton Road and Morning Calm Lane on Bakerton Road. Touch for map. Marker is in this post office area: Harpers Ferry WV 25425, United States of America. Touch for directions. Other nearby markers. At least 8 other markers are within 3 miles of this marker, measured as the crow flies. A.P. Hill’s March (approx. 2.1 miles away); Kennedy Farm (approx. 2.2 miles away in Maryland); John Brown (approx. 2.2 miles away in Maryland); Interior Fort (approx. 2.4 miles away in Maryland); Exterior Fort (approx. 2.4 miles away in Maryland); Stone Fort (approx. 2.4 miles away in Maryland); Lock 34, Harpers Ferry (approx. 2.4 miles away in Maryland); Civil War Campgrounds (approx. 2½ miles away in Maryland). 3. Graves of George Adam and George W. Moler, Jr. 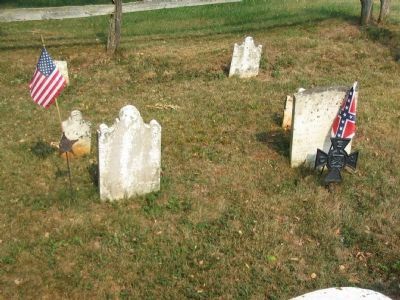 Note the Revolutionary War and the Confederate Veteran indicators in front of the respective tombstones. 4. Grave Site of George Adam Moler, Sr.
Stone appears to be more recent, perhaps replacing a damaged original. More. Search the internet for The Moler Family. Credits. This page was last revised on June 16, 2016. This page originally submitted on August 1, 2007, by Craig Swain of Leesburg, Virginia. This page has been viewed 1,518 times since then and 17 times this year. Photos: 1, 2, 3, 4. submitted on August 1, 2007, by Craig Swain of Leesburg, Virginia. • J. J. Prats was the editor who published this page.